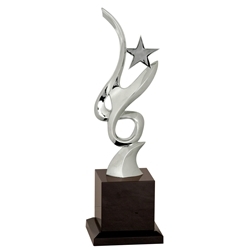 Jubilee Star Awards awards feature silver metal art sculptures on a black crystal base. Available in 2 sizes: 3.5" wide x 12.25" tall and 3.5" wide x 13.25" tall. These abstract awards are perfect for any corporate or special award. Item Size 12.25" or 13.25"